also leaves him feeling uncertain and different. 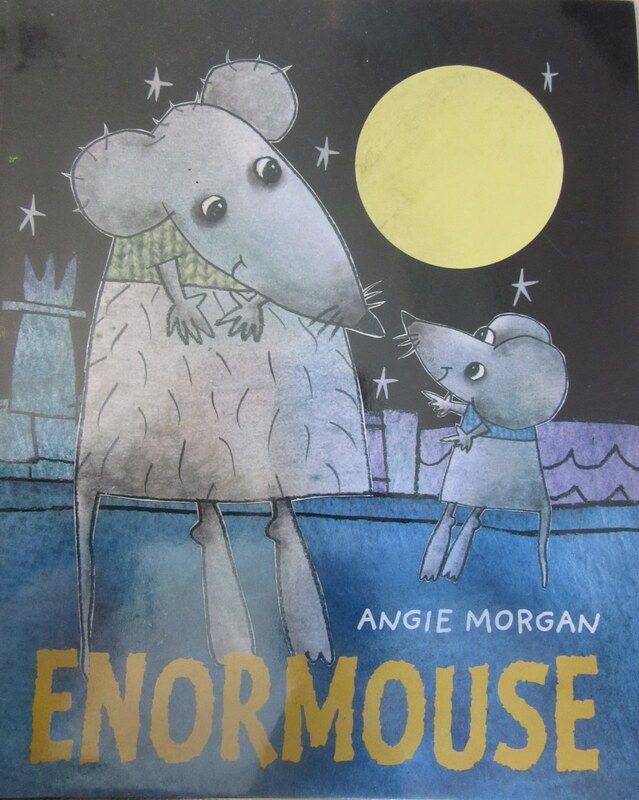 Eventually his friend Tinymouse works out that Enormouse is not in fact a mouse at all – he’s a rat! The other mice all laugh at him. Poor Enormouse is shocked and upset, but decides he must go and live with his real family, who own a dirty lair filled with rotten banana skins and flies. Filled with remorse, the other mice set off to go and find him and bring him home, but run into trouble on the way. The question is whether Enormouse can decide in time who his real family are. The illustrations in this book are fun and lively, conveying real character, and the touches of realism in the photographs in the rat book and the food in the rats den are reminiscent of Lauren Child. Angie Morgan does a good job of pulling you into the story through the appeal of the illustrated characters. The story is told clearly and sensitively with just enough detail to lift the language but not so much that the narrative is disrupted. If I have a criticism it’s that the story is a bit predictable. Perhaps it may be less so to young children who are not as familiar with how these things turn out, but it is clear from the beginning how the story will progress. That said, it is a very encouraging story about difference and about feeling accepted, with a nice message about home not necessarily being with people who look most like you. I could see it being useful to explore the issues surrounding adoption and what makes a family. If you are specifically looking for a book about difference and fitting in, this could be a good example to use. One of those books that immediately catches your eye, we picked this up in the library last week, attracted by the intriguing title and the bright orange colour. A small boy warns us to ignore anything on a cereal packet that offers a free lion in exchange for 100 coupons. 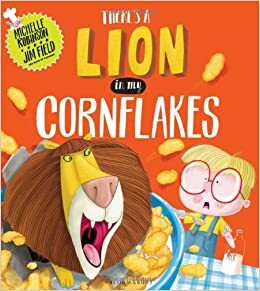 He goes on to explain why, telling us the story of how he and his brother collected 100 tokens, but by the time they had eaten all the cereal, everyone else had also already applied for their free lion. When eventually the cereal company gets round to their application there are no more lions left, so instead they send a bear. This does not go down well with the little boy and his brother. A bear cannot do any of the things they expected their lion to be able to help with. So they complain to the cereal company, who apologise and instead send a crocodile. And then a gorilla. As you can imagine, the house gets crazier and crazier and no lion ever appears. In the end however, the two boys realise there are advantages to what they have and that just about everyone has a lion; it’s not exciting any more. There’s a chatty, colloquial style to this book that works well given it’s set up as a recount. Moments like “how unfair is that? !” have an authentic ring of normal speech and make it easy to read aloud effectively as well as appealing to young independent readers. I think it’s probably a little too long and the pacing feels off at times but overall the story hangs together well and there’s a comic coherence to what’s going on. The illustrations by Jim Field are very successful, if occasionally a little too busy on some pages, but there are some great double page spreads such as the one where the park is filled with 19 lions and their owners. The message of the book is to accept what you have, even when that’s a bear, a crocodile and a gorilla instead of the lion you wanted, but it makes the point to look at the uses and opportunities you already have in a fun and creative way. Overall a light-hearted and entertaining book with a core of meaning. If I’m honest the central conceit of this story bothers me. There’s no set-up to explain why the rabbit has only just noticed he has a shadow. It seems a little unrealistic, and my awareness of that did colour my reading of the rest of the book. However, I can forgive it to some extent because I think there is a nice metaphorical meaning here about being afraid of oneself and finding the strength to fight off threat. 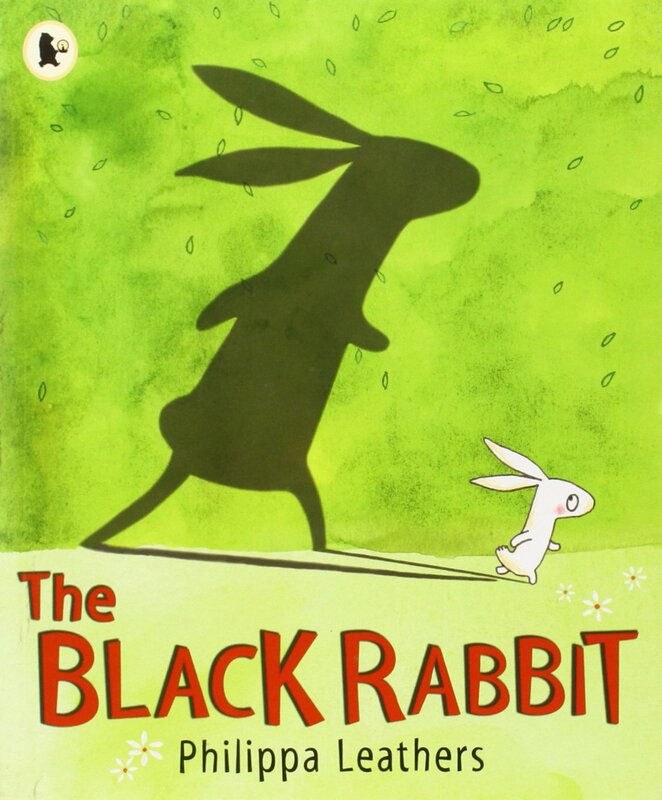 The wolf who chases the rabbit out of the woods is frightened by the huge shadow, and the rabbit as a result comes to accept the black rabbit and to make friends with him. If we take this far enough there’s even a suggestion here of using the things in yourself that you are most frightened of and coming to terms with them, even using them, to make yourself stronger and more powerful. There are some quite clever points about the shadow as well; when he hides behind a tree the shadow disappears, and of course it does when he enters the darker wood as well. The logic of the shadow is at least followed reasonably well – although I am still not quite sure how the handholding works in the final ‘scene’! Overall this is a decent book. It’s not something I’d suggest you rush out and buy, but might be worth picking up at the library for a read. Every time I come to write something about Quentin Blake I find myself at a loss how to describe him. How do you offer a comment on someone of his stature in the world of illustration and children’s picture books and it not sound paltry, cliched or sycophantic? What are we supposed to call him? The ‘divine’ Quention Blake? The ‘genius that is’ Quentin Blake? The spectacularly talented Quentin Blake? All of the above? After some consideration I think I’m going to stick with the ‘incomparable’ Quentin Blake on the basis that he probably is. Ok. Here we go. 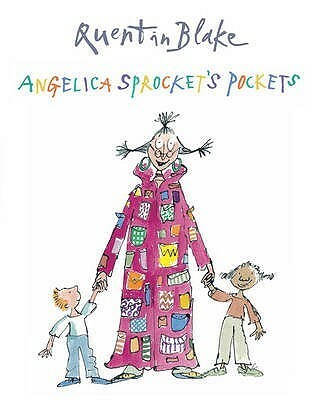 This then, Angelica Sprocket’s Pockets, is another offering from the incomparable Quentin Blake and was (I think) published in 2010. It’s a simple premise but full of well-mined potential. Angelia Sprocket has pockets galore, and in them she keeps a collection of ever more bizarre and unlikely things. We start with mice, cheese and hankies and fairly quickly graduate from car horns to cutlery and ice-cream to elephants. Of course none of these things would fit into the pockets on Ms Sprocket’s coat; she has many pockets but they do not seem particularly capacious and therein lies the humour and absurdity. A few additional bits of cleverness make this even better. Obviously the illustrations are superb, you could hardly expect anything else, but the placement of lines is also very good. 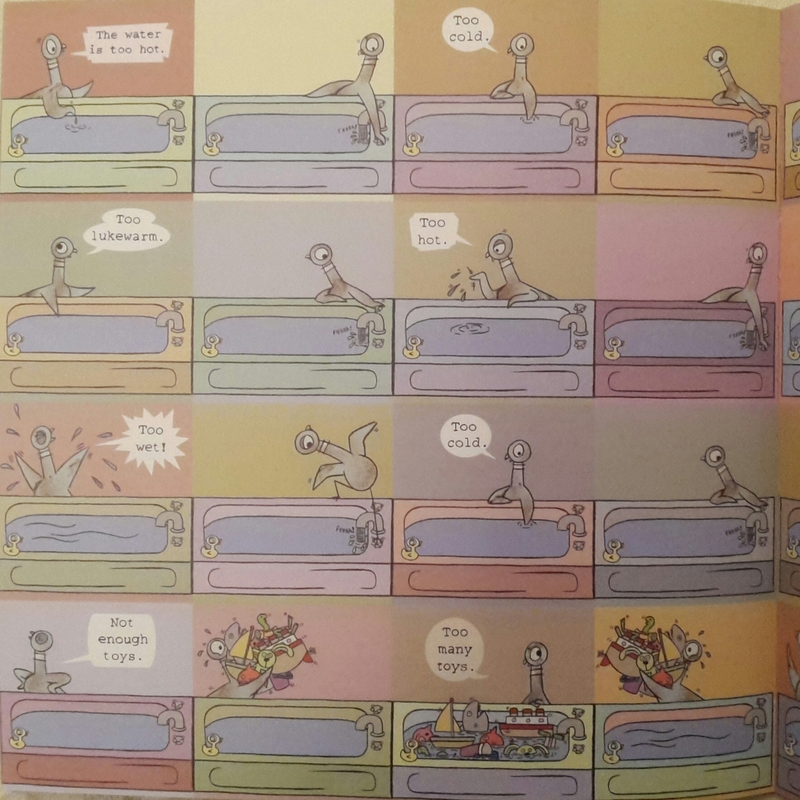 occurs on one page, flanked by pictures of skateboarding children, and the punchline is not delivered until you turn to the next page. The other feature is the strange, meandering rhyme scheme. It rhymes, but it does so after long, seemingly endless lines that disrupt the rhythm and in a way act like something being pulled out of these eponymous pockets. and all kinds of nice things to drink. It’s great. It’s simple, effective, brilliantly and wackily illustrated, a pleasure to read, surprising on several pages, funny and original – what can I say. Incomparable. 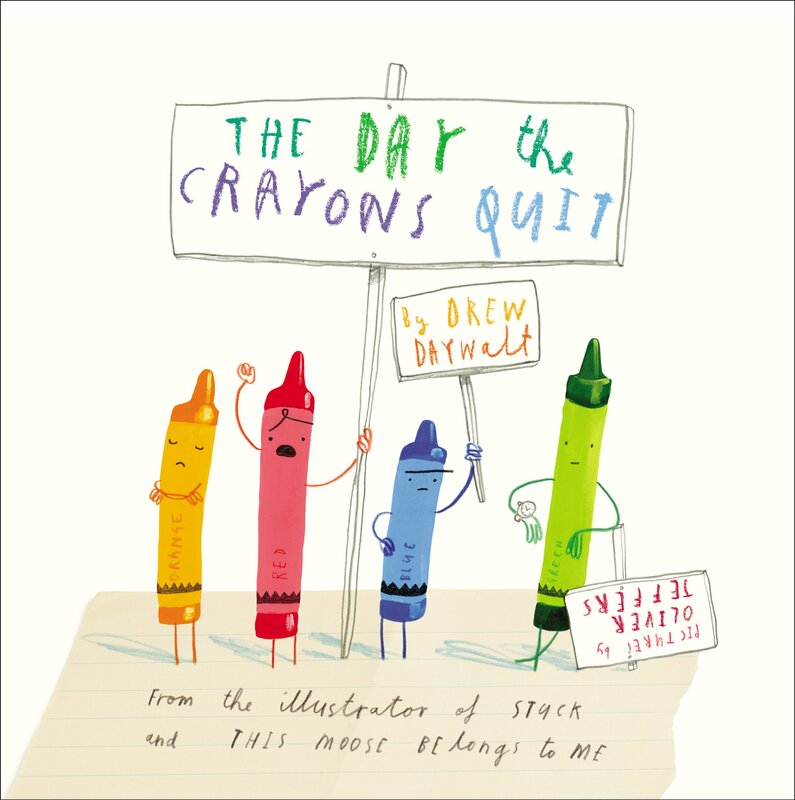 Drawn (though not written) by the superb Olive Jeffers, this is a creative and unusual story about the right and wrong way to use a box of crayons. 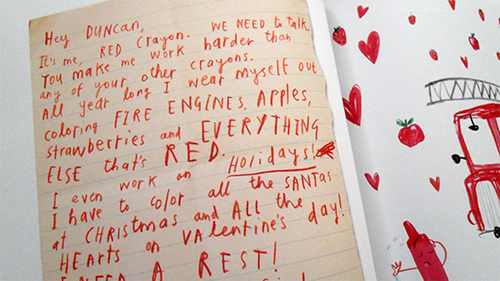 It takes the form of a series of letters, purportedly from Duncan’s crayons, complaining about his habits and asking him to change. Frankly, the crayons are an irritating bunch. Red complains about never getting a break. Blue feels he is overworked and consequently stubby. Grey feels like he spends too much time colouring enormous things like elephants and rhinocerouses and not enough time on small easy things like pebbles and baby penguins. Purple feels Duncan does not colour neatly enough. Yellow and orange argue vociferously about which is the true colour of the sun. Beige crayon is thoroughly irritated, sick of coming second to brown bemoaning that he only gets to colour turkey dinners and wheat – “and let’s face it, what kid ever got excited about colouring wheat?” Only green has anything really positive to say, congratulating Duncan on his career in ‘colouring things green’ so far. By far the funniest page is that about the poor peach crayon who’s been stripped of his wrapping and hides, naked, in the crayon box. In the end, Drew Daywalt’s entertaining wander through the messages of the crayon box culminates in a spectacular picture from Duncan who tries to accommodate all his crayon’s wishes at once. It’s a good talking point with children, allowing you to discuss what each crayon wanted and whether Duncan has been able to do it or not. You can spot all the references back to the rest of the book, which is obviously good for comprehension and reflecting on reading. 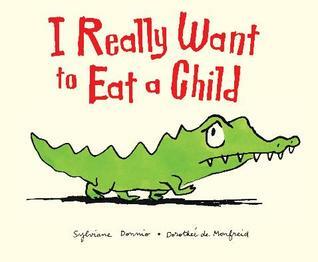 This is a funny book, with a level of humour that works well into the primary school years. If I have a criticism, it’s that the format is quite repetitive. The stories from each crayon do not really build on or from each other, so the middle (and dominant) section of the book is like a list rather than having any narrative drive forward. There are a lot of crayons, and it does get a little repetitive in form. However, there is just enough detail and difference between each letter to keep the reader engaged despite this. It’s certainly proved very popular with the children who’ve read it and the 6 year old has taken it off to read repeatedly to herself. Drew Daywalt won the Good Reads Choice Award for Best Picture Book with this, and it is certainly an original and enjoyable piece of writing for 3-7 year olds. The charmingly grumpy crocodile on the front of this book is young Achilles, who desperately wants to forgo his diet of bananas and eat a child instead. His Mum and Dad are concerned at his sudden loss of appetite and attempt to coax him into eating by providing him with a large sausage and an equally enormous chocolate cake. To no avail, however. Achilles will not be tricked into eating and stalks off to the river to find himself a child to eat. Now to that point we have only seen Achilles in relation to members of his family. To that point you are reading with a very small concern that there may actually be some child-eating involved in the story, and wondering quite how to broach the subject with a potentially concerned pre-schooler. Then this happens. 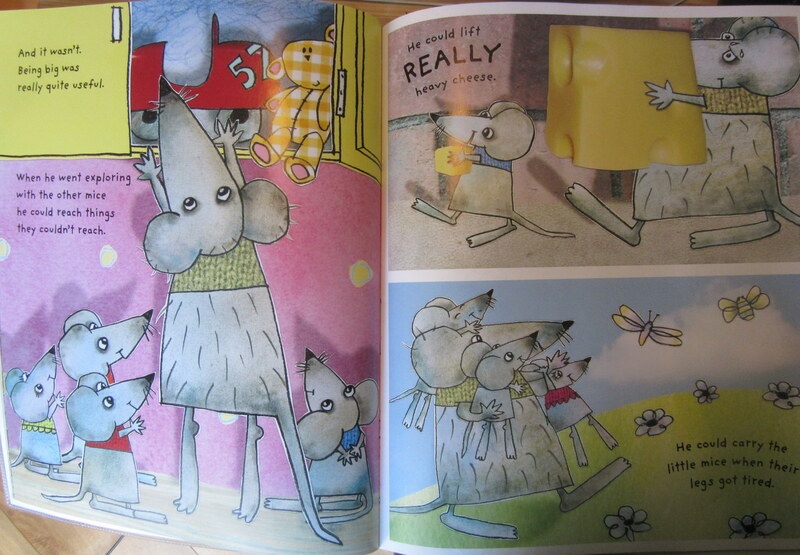 The illustrations in the book are fun, bright and charismatic, with a lovely feel for the setting. 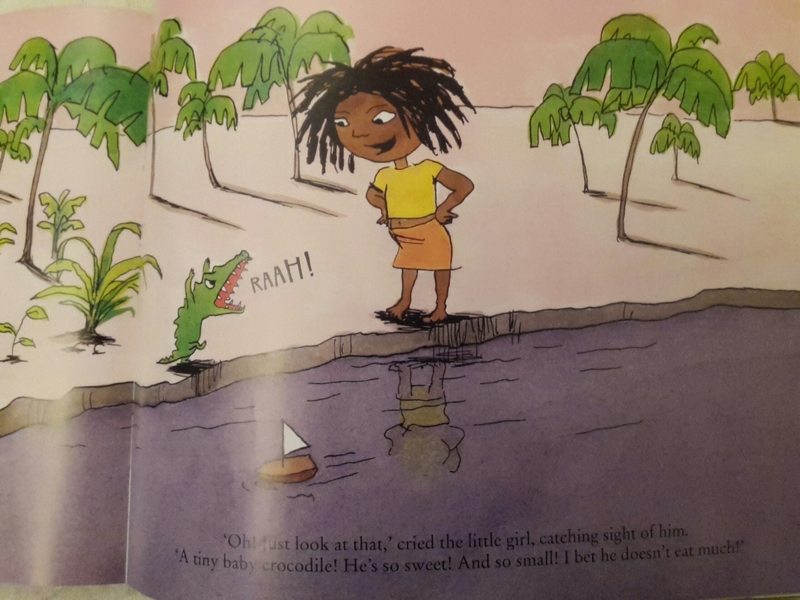 The book was originally written in French (under the title Je mangerais bien un enfant) and there is a very slight foreign edge to the rhythm of the language in translation, which actually works well for creating a ‘voice’ for the crocodile family. The premise is funny, but straightforward, with the kind of ironic humour that appeals to children and adults alike. There is also the subtext of a commentary on fussy eating; for those who are on the pickier side of the table, the message is clear enough – eat what your Mum and Dad tell you to so you can get big enough to eat what you like – but perhaps not dramatic enough to really engage the child on that particular level. However, it could certainly provoke a conversation about nutrition and eating, and notwithstanding its status as a ‘message’ book, it is entertaining and enjoyable without even taking that into account. Achilles is an appealing and memorable little crocodile; it’s certainly worth making his acquaintance if you get the chance. I loved the first ‘pigeon’ book, Don’t Let the Pigeon Drive the Bus, and enjoyed the second, Don’t Let the Pigeon Stay Up Late, but this, if lacking in the same punch of originality you got with the first, possibly tops the lot. There are great moments during this excuse phase, one of which is the way that at every turn he realises his arguments are flawed. The flies he claims are “purely coincidental” depart with an indignant instruction to “take a bath dude” (do it in a voice like you’ve swallowed helium and it’s even funnier). He even turns on the reader to deflect the issue and asks “When did you last have a bath?” only to coo despondently “Oh. That was pretty recently.” The quality of the language and the use of common phrases is even better than usual in this one and it is a real pleasure to read. However the climax of this book is the inspired section when, having finally agreed to the bath, the pigeon tries to make it to his liking. It’s too hot. Too cold. Too lukewarm. Too few toys. Too many toys. Too hot. Read punctuated with the ‘pssst’ of the bath tap this reduces even my six-year-old to hysterical giggles. If I have a criticism, it’s that the replies the pigeon requires are more complicated than the original. In the Bus version, usually only ‘No’ is required to shut the pigeon up, and this can be understood and said by children of a very young age. In this you actually need to understand what the pigeon is implying and ‘no’ is not an adequate or appropriate response. It means that to get most out of the book the adult reader needs to do more on both sides of the conversation and model possible answers to the child. It’s not a bad thing, but it is an area in which this book falls down slightly compared to previous incarnations. We’ve only had this a week and we’ve had to read it at least once every day, which is no hardship whatsoever. 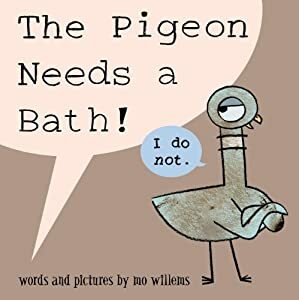 It’s a great one to share, a great one to encourage children to speak and argue with the pigeon, and genuinely very, very funny. Just go and buy it. Go on.